Portrush East Strand starts at the Arcadia and borders the Whiterocks. Over 2 miles of golden sand, backed by sand dunes and the Royal Portrush Golf Course. Curvaceous walkways, landscaped gardens, seating and play areas help you soak up the atmosphere of the East Strand. Portrush East Strand or Curran Strand is a Blue Flag Beach on the eastern side of the Portrush Peninsula and is one of Northern Ireland's most popular. This golden sandy beach is perfect for water and sand activities of all types. Swimming, walking (including dogs except with summer restrictions), surfing, body boarding, diving, horse-riding, kayaking, walking, jogging or fishing are all experienced on East Strand. A Life Guard is on the beach everyday between 11am and 7pm from 21st June until the 7th September. 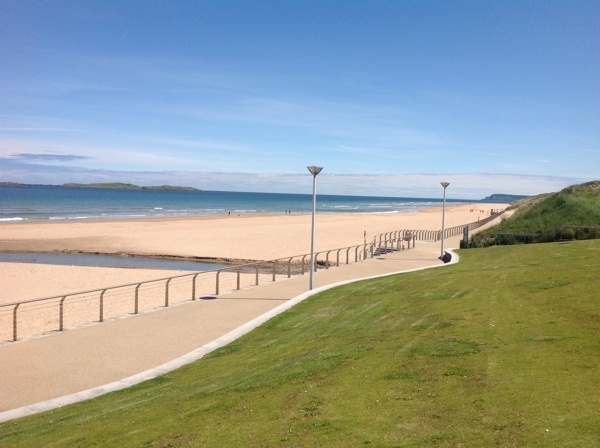 There are eight beaches in Northern Ireland awarded the 'Blue Flag' and all three of Portrush's beaches have it. Admire the sweeping views out to the North Atlantic Ocean and the Skerries, a group of small rocky islets a few miles offshore. Join the East Strand at Arcadia via the great steps in from off Main Street. It starts at the Arcadia area, a small sandy bay on a rocky outcrop with the historic Arcadia building majestically positioned on it. This unique Portrush landmark was built in the 1920's has been a popular Victorian seaside cafe, a fashionable ballroom opening in 1953 and today it is thriving as a Well Being Centre, Cafe and Gallery. Yoga, Pilates, Tai Chi and Dance Classes for adults and children are offered, plus art exhibitions and musical concerts happen regularly. Old photos from as far back as the 1800's show this stretch of the East Strand being a Ladies Bathing Beach. A leisurely stroll down past the play area and pool brings you to the curvaceous Promenade with its wavy walkways and railings down to the Watersports Centre, Car Park and Toilets with disabled access. With the user friendly steps down from Main Street, the great new lighting for a warm after dark experience, the manicured gardens and parks, plus the 'To the People of the Sea' public art, all these features provide an inviting welcome to Portrush East Strand and bring an upmarket, clean and abundant feel to this historic area. The car park, off Causeway Street, has over 600 spaces and is the main beach access. The Watersports Centre provides excellent facilities. Saturday morning run on the beach..
At 9.30am every Saturday morning you can take part in or observe the Portrush Parkrun. This run is a timed free run along East Strand beach to the Whiterocks and back. The course begins on the beach, just beneath the Watersports Centre. This is the first beach parkrun in the world run entirely on sand. The annual Causeway Coast Triathlon is held every year in June at the East Strand. With Swimming, Running and Bike Tracks reaching as far as Bushmills. The world famous Royal Portrush Championship Golf Club is located right behind the sand dunes. This not only provides a breathtaking game of golf, but keeps the area behind the beach in pristine condition and beautifully 'green'. The world famous Dunluce Links Course is prestigiously placed right behind the East Strand beach and is overlooked by the ruins of Dunluce Castle from where it takes its name.